If you’ve ever ordered a “spicy” dish in the Upper Midwest where I live, then you need to understand something about this Spicy Shrimp Pasta: it is a legitimately spicy spaghetti. This recipe is sponsored by DeLallo. I know that all palates are different and that some people are more sensitive to spice than others. After six years of living in Wisconsin, however, I’ve decided that on a scale of 1 to 10, this state starts panting and sweating at anything above a 2. It doesn’t mean the food here is bland. It does mean that when a menu describes a dish as “spicy,” you need to have a heart-to-heart with your server to decipher what “spicy” actually means: really, actually spicy or Wisconsin spicy. Note: Wisconsin spicy is not spicy. This recipe for Spicy Shrimp Spaghetti is! It won’t light your tongue on fire or send you running for an emergency glass of milk, but it does have a nice kick to it. If you love your food with a bit of an edge every now and then, you’ll go just as crazy for this healthy shrimp pasta recipe as Ben and I did. Not only does this Spicy Shrimp Pasta have stellar flavor, but it’s loaded with good-for-you ingredients. Whole grains, fresh veggies, and lean protein represent, and it’s ready start to finish in 30 minutes, 25 if you hustle. My top goal for the recipes I share on this site (and will be publishing in my upcoming cookbook!!) is to make healthy recipes faster and more approachable, without sacrificing taste. 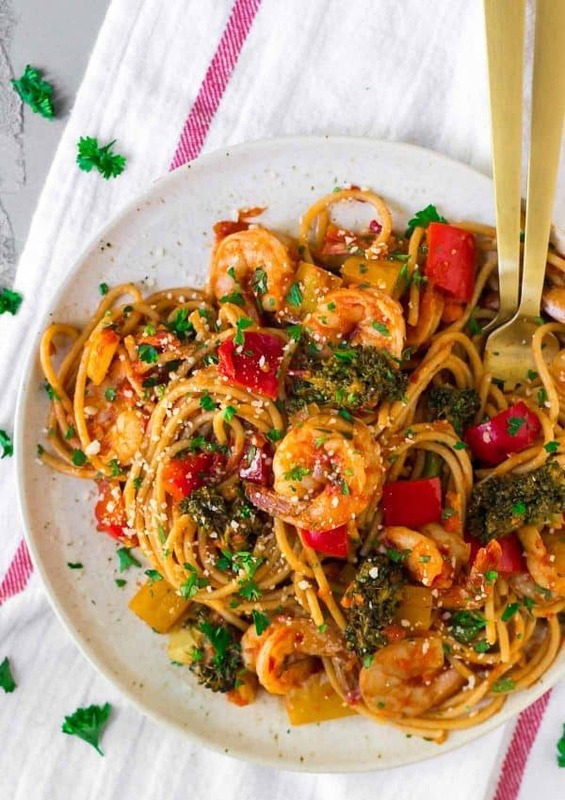 Recipes like this Spicy Shrimp Pasta (and its cousins, Garlic Shrimp Pasta and Healthy Shrimp Scampi) have been a true blessing in this hectic season of life. 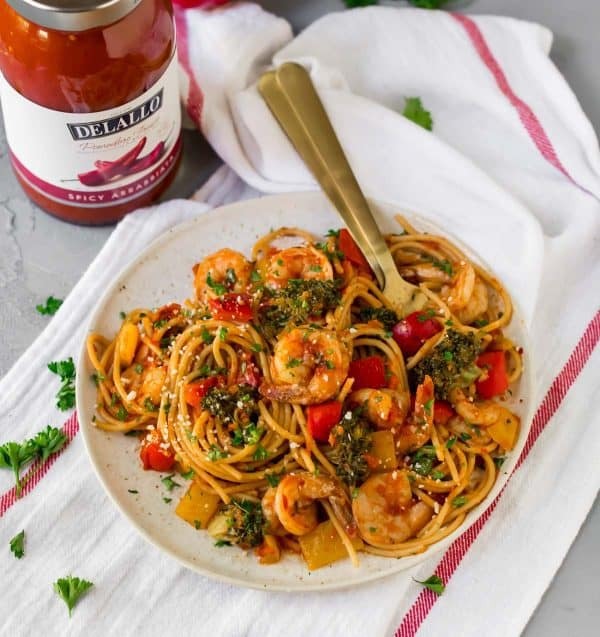 This shrimp spaghetti’s combination of fresh ingredients mixed with pantry staples has kept healthy eating attainable for us, even amidst the mad chaos. If your weeknights are busy (and I suspect that they often are), then this healthy shrimp pasta will be a true help to you too. 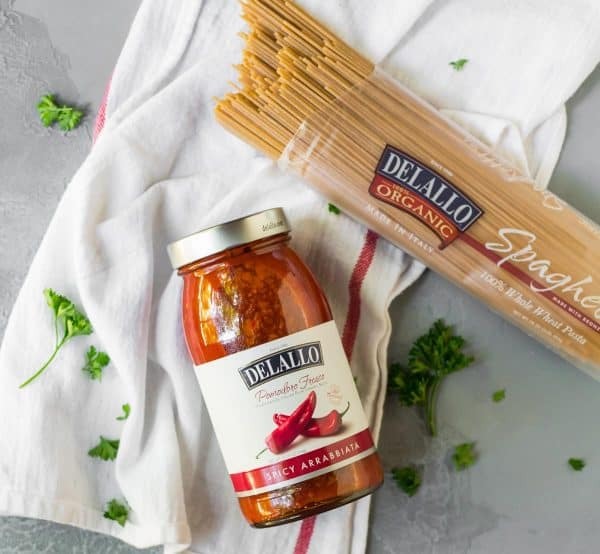 My secrets to ensuring that this recipe is quick to prep and healthy without skimping on flavor or texture are DeLallo Pomodoro Fresco Spicy Arrabbiata Sauce and DeLallo Whole Wheat Spaghetti. Store-bought pasta sauce and whole wheat pasta noodles are two of my top pantry items, and I am picky about both. In a spicy shrimp pasta with red sauce like this one, the top source of flavor is the sauce itself. This tomato sauce has so much bang to it already, I didn’t need to doctor it up with additional ingredients. It tastes yummy and fresh right out of the jar, and as we’ve discussed, it delivers on its spicy promise. Whole wheat pasta is another area where I am demanding. One of the fastest, easiest ways you can boost your diet without adding a moment to your prep time is to use whole wheat pasta noodles in place of white. Unfortunately there are a lot of bad ones out there, to the extent that whole wheat pasta has gotten a bad reputation it doesn’t (always) deserve. I’ve been so happy with the flavor and texture of DeLallo whole wheat noodles. They cook up perfectly al dente and taste fantastic. I promise no one in your household will suspect that the pasta they are eating is actually 100% whole grain. For this recipe, I opted for classic shrimp spaghetti, but you could also make it a spicy shrimp linguine or fettuccini if you like your noodles a bit thicker. A short pasta such as penne would work nicely too, though personally I love twirling the long noodles around each juicy piece of shrimp. 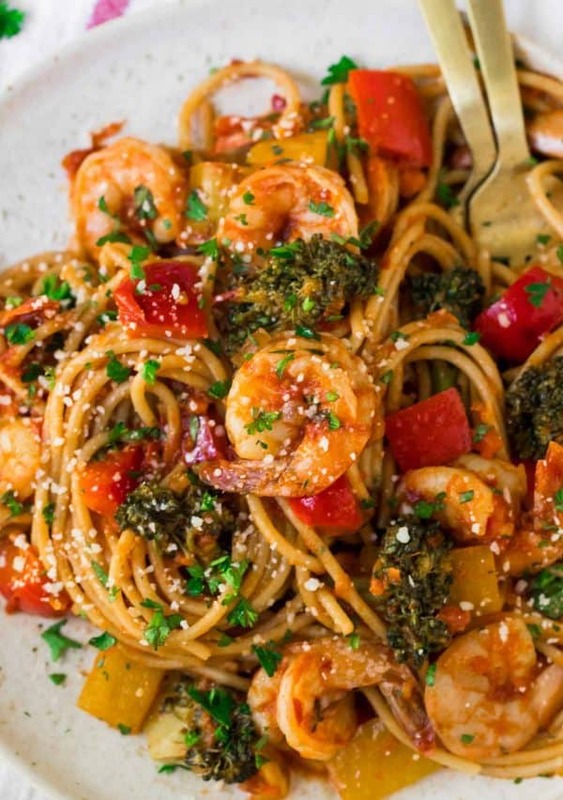 In addition to celebrating the beauty of fast, healthy recipes, I’m also sharing this Spicy Shrimp Pasta in honor of Italian Heritage Month, which takes place in October. It’s an occasion to honor the achievements of Italian-Americans…and I’m taking it as a tasty excuse to eat more Italian food too! Spicy Shrimp Pasta. A fast, flavorful, healthy shrimp recipe! With garlic, fresh veggies, whole wheat noodles and an easy tomato sauce. Quick and delicious! Bring a large pot of salted water to a boil. Cook the noodles to al dente according to package instructions. Meanwhile, heat the olive oil in a large, deep skillet or Dutch oven over medium-high heat (a big wok works too). Once the oil is hot, add the broccoli, red and yellow bell peppers, and salt. Let cook for 2 minutes, then add the shallot. Continue cooking until the vegetables are crisp-tender and the shallot is beginning to brown, about 3 additional minutes. Add the garlic and cook just until fragrant, about 30 seconds. Stir in the pasta sauce. Bring the sauce to a gentle boil. Reduce the heat so that the sauce simmers gently. Stir in the shrimp and let simmer until the shrimp are cooked through—they will go from gray/blue to pink and opaque—about 5 minutes. Drain the pasta and immediately add it to the sauce. Toss to coat the noodles in the sauce and evenly distribute the shrimp and vegetables (a pair of tongs is very handy for this). Sprinkle with parsley and Parmesan. Enjoy immediately. I am sharing this post in partnership with DeLallo. As always, all opinions are my own. Thanks for supporting the brands and companies that make it possible for me to continue to create quality content for you! We’ve moved to WI 3 years ago from ID. We miss Mexican food especially and our favorite Chinese restaurant. My friend was originally from MN. Their “spaghetti” is spaghetti noodles, butter, salt and a bit of pepper! Yay, ya’ betcha! We’ve always had our numbers 1-10 for heat at Asian restaurants, me 5, Spouse 3. We ate at Thai Garden near the closed Sam’s Club in Madison. We did our heat level. OMG, turns out they have a 1-5 heat scale! Look forward to trying the recipe. WOW that would be a transition for sure! I hope you enjoy the recipe! Awesome recipe! Love the spicy flavors of the sauce, and I totally need to try this whole wheat pasta. I’m a sucker for carbs, but want to try and make it healthier. Whole wheat pasta is definitely the way to do it, Danielle! I can definitely relate to the spicy rating being different in Wisconsin verses Texas and other states. I was born and lived my early years in Wisconsin. When my parents moved my family to Texas it was a flavor awakening of sorts. Now I enjoy spicy foods that would probably have scorched my Wisconsin palate. Ha! Your recipe looks delicious. I like all the additional vegetables you used with this shrimp and pasta recipe. I am also a big fan of using whole wheat pasta.